Dental night guards are one of several treatment methods prescribed by a dentist to address various types of dental disorders. These problems occur during sleep and can cause damage to teeth and overall mouth alignment. 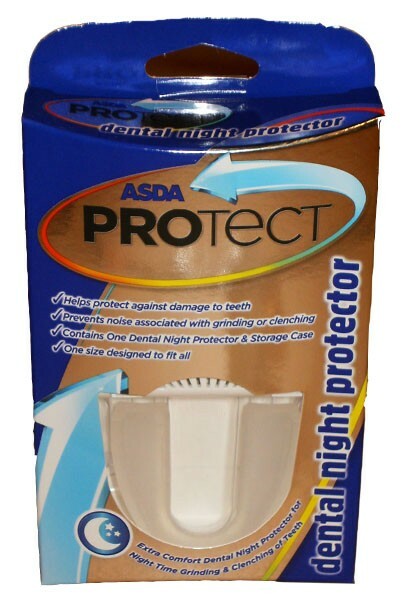 Dental night guards are either custom-made or purchased over the counter. The decision regarding which type of dental night guard to use is based on the problem to be corrected. A dentist prescribes dental night guards to treat cases of bruxism, commonly known as teeth grinding. The mouth guards are also used to stop jaw clenching and teeth grinding associated with temporomandibular joint (TMJ) disorders. Custom mouth guards are considered more effective because they are designed specifically for your mouth. Your mouth is measured for the device and it is designed according to the contours of your mouth’s interior. Over-the-counter dental night guards are one-size-fits-all type mouthpieces. As such, they do not match up exactly to your teeth formations. They can be found at most pharmacies and big retailers or purchased online. They don’t need any preparation and can be used straight away. They tend to be bulky and may make it hard to breathe. 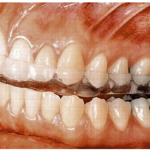 Without an exact fit, generic night guards may also not be as comfortable or effective for people who have severe teeth grinding or jaw clenching issues when sleeping. Teeth grinding could also cause them to loosen or fall out, since over-the-counter dental night guards do not provide a tight, snug fit. Because over-the-counter dental night guards are less expensive than custom-fit ones, many people try them first to see if they alleviate the problem. A popular style is boil-and-bite dental night guards because their construction allows an impression of the teeth to be made. With some over-the-counter designs, the dental night guard is boiled in hot water so the plastic becomes pliable enough to fit over your upper or lower teeth to make an impression. Once the plastic hardens, the end result is a night guard that matches the alignment of your teeth. Other brands offer self adjusting technology to allow users to fit the device to their mouth. Double-wall construction is better than single-wall because they fit tighter and are similar to custom-made ones. Single wall guards usually take an impression of the teeth. This is the normal construction of the boil and bite types. Single wall guards are good enough for use on a short period of time. It is best used for sports activities. Double wall types are the ones built for a whole night’s use. 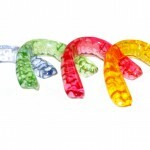 Also select dental night guards made of strong, soft plastic. If damage to the mouth continues, a custom dental night guard should be considered. Complete coverage night guards cover the entire upper or lower set of teeth in the mouth, from the occlusal edges to the gum line. 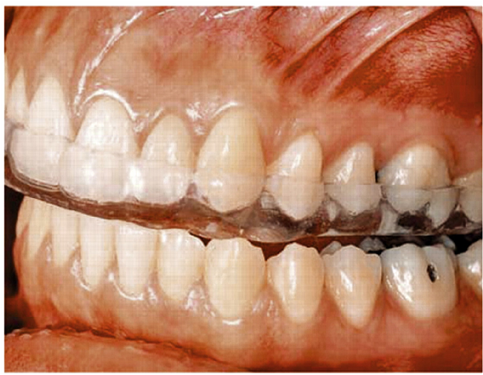 These guards do not modify the bite in any way as they simply protect the top row of teeth from grinding against the bottom row. All of the teeth come into contact with the device at once using this guard. 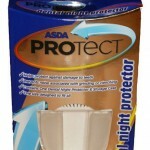 This can be a conservative and safe choice for a night guard and it is one of the most frequently used. Partial coverage appliances cover only part of the teeth, with the night guard stopping well before reaching the gum line. These appliances may modify your bite slightly but in letting some of the teeth contact they let the mouth properly relax the muscles used for closing. This leads to less grinding of teeth and clenching of the jaw. Some night guards, whether they are partial coverage or complete coverage, intentionally reposition your bite. These devices are meant to make your bite less prone to the grinding problems of bruxism. The device is fitted to your teeth and then it is altered gradually by your orthodontist to move your teeth in a specific way over time. Most prescription night guards are made of a hard acrylic material which prevents the teeth from altering the mouth guard in any way. This also makes it less likely that a patient will bite through a mouth guard overnight. Soft mouth guards are also available and can be more comfortable to patients. If a patient does not have an extreme case of bruxism and only has slight teeth grinding, a soft night guard can be a more comfortable choice. 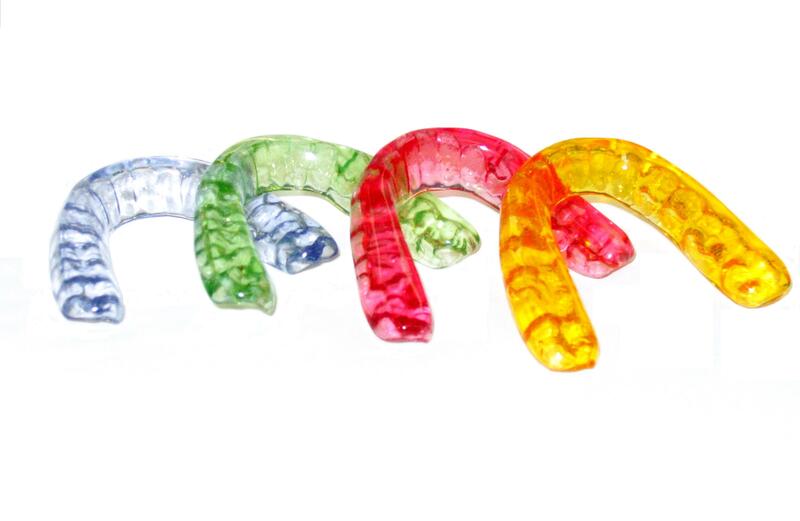 A dental night guard slides into your mouth, covering one or both rows of your teeth. The nonbulky mouthpiece is used only while sleeping. Dental night guards are made from soft material and comfortably fit in the mouth to prevent upper and lower teeth from making contact as you sleep.